Some call it the “humpback highway”. Australia’s east coast is a migration path for humpback whales as they make their way from Antarctica to the warm waters of northern Australia to breed and give birth. And for us, it is a chance for fleeting encounters with these majestic giants of the oceans – if we are lucky. Nature ensures there are no guarantees of such encounters, but by joining whale watching trips on two consecutive days this week, off Queensland’s Fraser Island I was able to get an up-close view – and some wonderful photographic memories – of humpback whales as they headed south again. Southern Humpback whales leave the krill-rich feeding grounds of Antarctica in May and make their annual 5000 kilometre journey to the breeding grounds in the warm waters of the Whitsundays, north of Fraser Island. 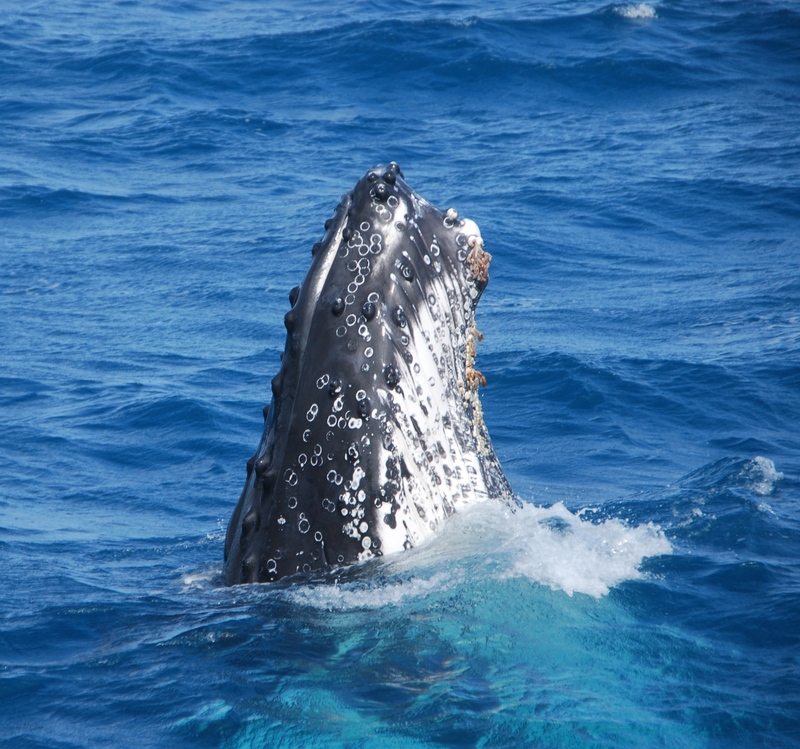 After spending a short period of time in the Whitsunday area the whales start the long journey south. One of the places they like to linger and play is Platypus Bay, off the north-western coast of Fraser Island, in Hervey Bay Marine Park, where the calm and safe waters provide a great environment for resting, socialising and playing with their calves. Whale watching boats head out daily from Hervey Bay on the mainland, stopping at Fraser Island’s Kingfisher Bay Resort to pick up passengers. 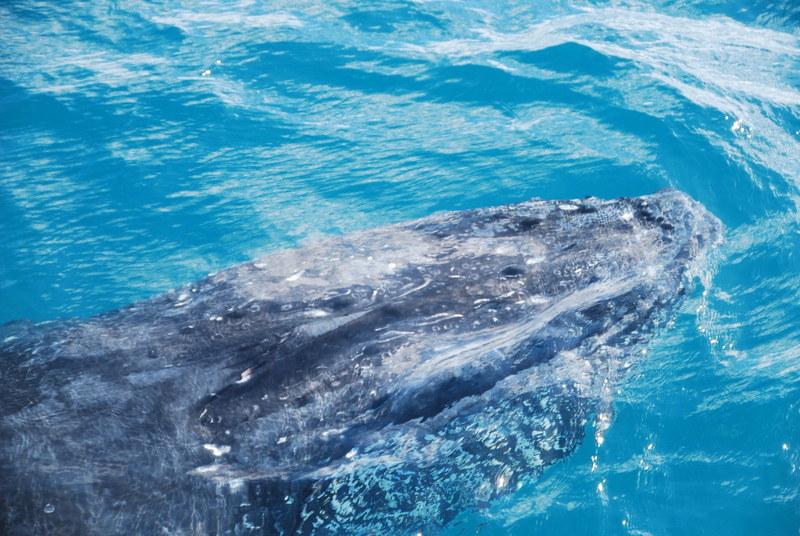 I was eager to join a whale watch this winter, as for the first time, the chance to get into the water and swim with the whales is being offered while “whale swims” are trialled in the Hervey Bay region. However, this comes with strict safety conditions – and unfortunately for anyone keen to try it on the days I was aboard, those conditions weren’t right. 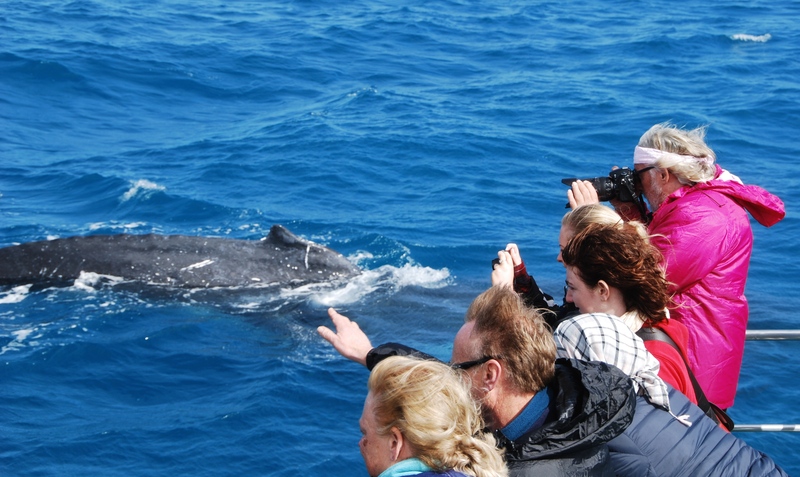 Whale watch operators are required to abide by existing regulations under the Nature Conservation Act, as well as the conditions of their existing permits, according to Fraser Coast Opportunities general manager David Spear. This includes adhering to the rule that boat engines must be turned off before whales are within 100 meteres of the vessel; the same rules apply under the “immersion with whales” experience. 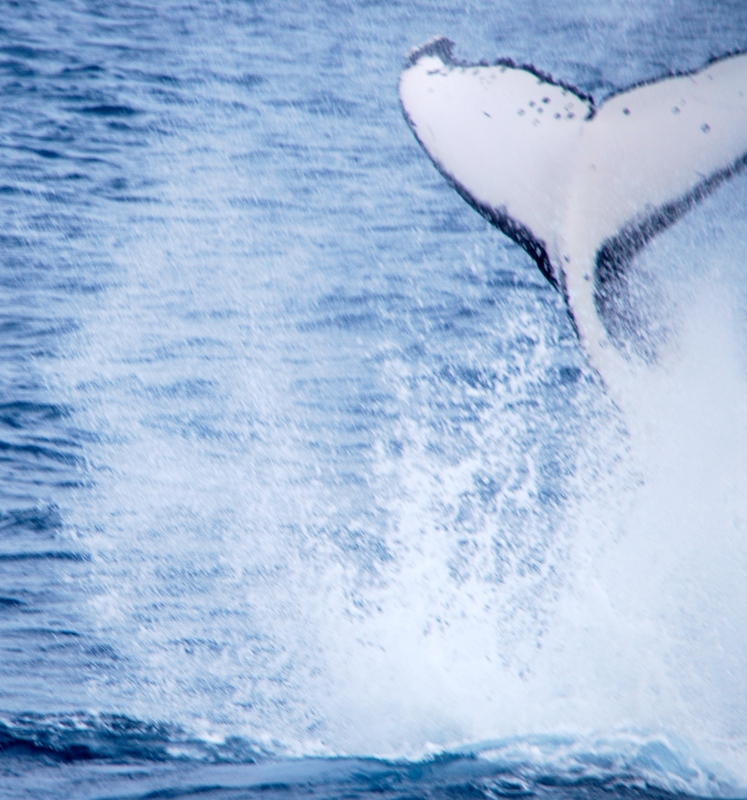 Getting into the water – for humans – is dependent on both the weather and the whales. The welfare of the whales and the safety of the participants are both paramount, and a number of checks and balances are in place. People entering the water need to be outside the 100m distance limit and wait for the whales to swim up to them to interact. On Quick Cat II, six people (including a deck hand) are allowed in the water at a time, wearing life jackets and snorkels, and attached to a rope with a life ring. On both mornings I was aboard Quick Cat II, the weather was mainly overcast and windy, and the water quite choppy. And the whales were very active! But not getting into the water did not mean we didn’t have close encounters. On the first day, three pods came over to have a look at us. The first was three whales (a pod is two or more), but there was great excitement when after spotting our third pod of the day, it came together with the second pod! In one extraordinary moment, we had four giant humpbacks lined up in a row, swimming toward the boat for a closer look at us. Shutters clicked, there were gasps of delight, and arms waved wildly to attract these keen-sighted mammals. The whales swam close to the boat, under it, around it…popping up now and then to have a good look – a move called “spy-hopping”. Tails waved in the air, pectoral fins slapped the water…it seemed almost as if they were as happy to see us as we were to get a good look at them! 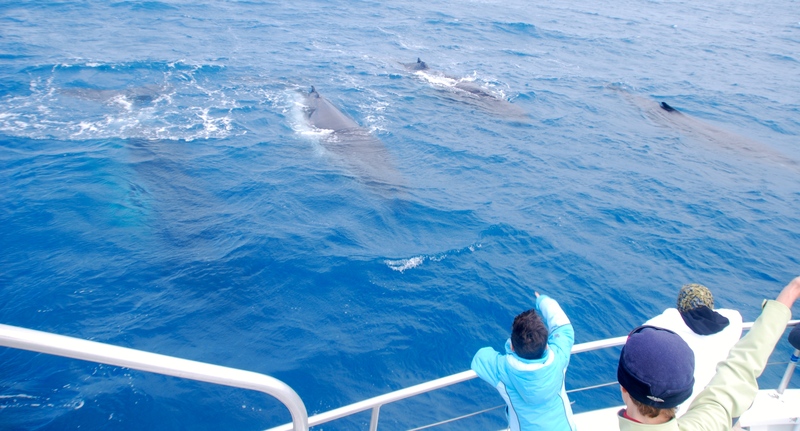 At one point, three whales popped up simultaneously – to the delight of those on the boat! On this day, they were not keen to leave us. And until they moved off a little, Captain Brian Perry wasn’t able to start the engines to head back to land. So once again, the humpbacks were in charge. We had been – as the saying goes – “mugged”. 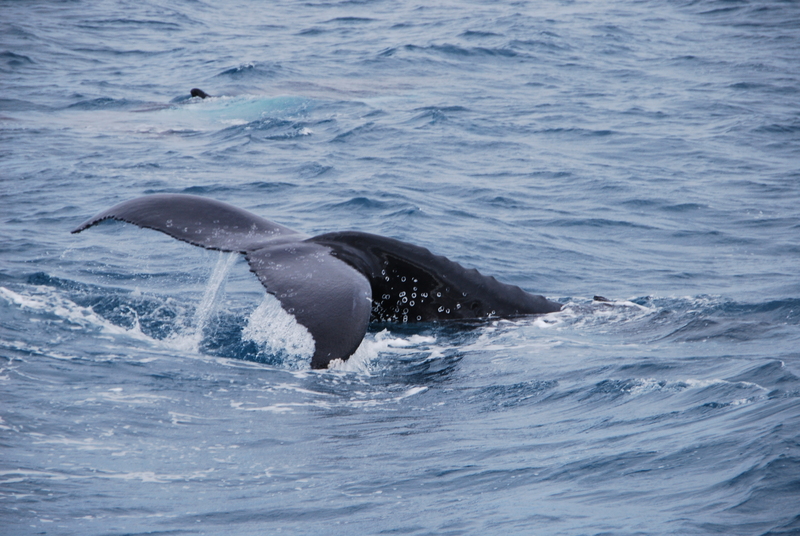 On the second day, we saw another five whales (or were some the same as the previous day?). Another unforgettable experience, with the sun shining on gleaming tails and fins, and a lot of tail-slapping. The only thing the whales didn’t do – or at least not close enough for us to really see and photograph – was breach, where they throw their whole body into the air and slap down into the water. In pre-whaling days around 10,000 whales were estimated to migrate along this coastline, with around 30,000 living in Antarctic waters. When whaling was banned in 1963 the number thought to be left was only about 200. Today, the whale population has undergone a fantastic recovery, with more than 7000 whales visiting these protected waters each season, staying anywhere from one to 10 days. So, I didn’t get to swim with the whales. But actually, I didn’t care. They are huge creatures and I certainly wouldn’t have wanted to be in the way of one of those tail-slaps! But it was such a memorable experience to just watch these magnificent and graceful creatures in their natural environment, to share their curiosity about another species, and to know that they are now protected. I didn’t need to be in the water to do that. 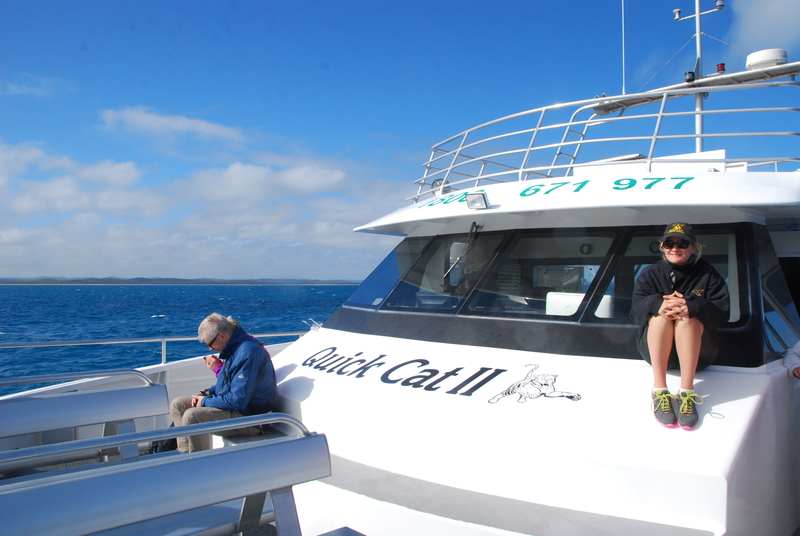 Quick Cat II (Hervey Bay Whale Watch) leaves Fraser Island daily during the season (August to October). Cruises cost $110 for adults and $70 for children aged 4-14. Whale swims cost an extra $75 per person. 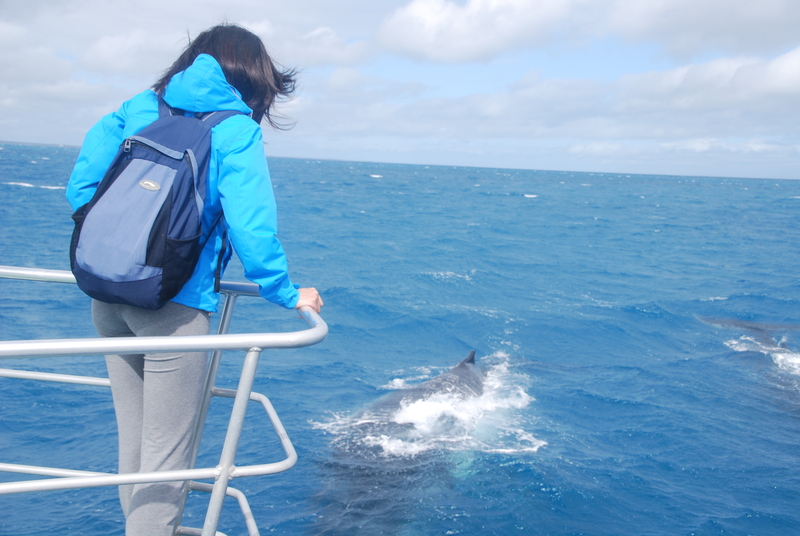 Swimming with the humpbacks can only be booked on the boat on the day (it cannot be pre-booked as part of a package). A Glass Half Full stayed at Kingfisher Bay Resort on Fraser Island and whale-watched with Quick Cat II as a guest of the resort. Great post Lee, I’ve enjoyed seeing the photos from both you and Richard over the last two days. Now more than ever I want to go to Fraser Island! Thanks! I have more to come and I sure that Tommy does too (no-one calls him Richard :-) ). It was a wonderful experience! Wonderful story Lee and love the fact that everyone realised the whales were in charge! Indeed! I’ve just watched a news report on the ABC about the Queensland whale swims…exploring the pros and cons. It’s a three year trial, so will be interesting to see how it goes. Thank you Sue! They are gorgeous creatures. How magnificent! I saw whales in Alaska, but it was against steely gray water. The water in your pictures makes it even more stunning. How fantastic to see so many! Gorgeous pics and I’m very glad you didn’t get to swim with them:). Just thinking about that gives me the shivers! Well, I was of two minds about the swimming idea. But as it was, nature took the decision away from me (for which I was thankful too). Do I take it you wouldn’t be lining up for the swim? Wonderful photographs and a wonderful place to holiday. Everybody, jot it down on your list of destinations. I should know, I was there the same time as Ms Mylne. Amazing. I’m glad you concur, Tommy. This was my third visit to Fraser Island – the last one many years ago – and it never disappoints. Magnificent in all respects. These photos are amazing! Those are precious moments that will forever be remembered! I am so happy for you in getting to enjoy the whale watching experience.